On Tuesday, April 26, two dozen eager Mechanical Mayhem students and mentors piled onto a bus. The destination: St. Louis, MO! Along the way, we picked up our old friends from team Andromeda One (4905) from Ayer, MA. 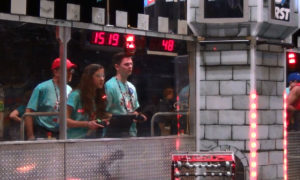 Together, the two teams played board games, watched movies, and talked about the robots they looked forward to seeing at the World Championships! Upon arriving in St. Louis, our students listened to robot conference talks, visited the Innovation Faire, toured downtown St. Louis, and even rode to the top of the Gateway Arch! The fun really started, however, when the competition began on Thursday morning. 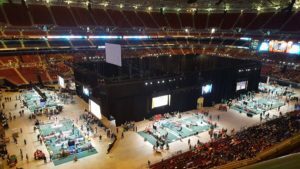 As Mayhem entered its ten qualification matches, we partnered with teams from all over the US and around the world. With a qualification record of nine wins and one loss, we earned the third seed position. Our team selected the Robonauts (118) from League City, TX; the Friarbots (3309) from Anaheim, CA; and the Pascack PI-oneers (1676) from Montvale, NJ, to join our alliance. Unfortunately, we were unable to move beyond the quarterfinal level. 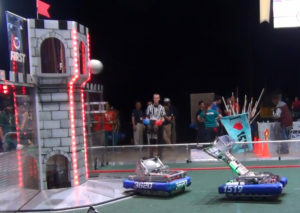 We congratulate our opponent alliance (ThunderChickens, 217; Code Orange, 3476; CyberCavs, 4678; and Blizzard, 188) for continuing through the elimination brackets and winning the Newton Division. After watching the spectacular Einstein matches, a very exhausted Mayhem and Andromeda One embarked on our return journey to New England: a journey marking the end of the 2016 tournament season. Looking back over the year, it is truly amazing how much the team was able to accomplish. Rookies comprised 63% of the Mayhem student body, while freshman/middle school students comprised 35% of our team this year. Despite these challenges, the team has managed to pull off a four-blue-banner season. It’s not all freshmen and rookies, though: this year, we say goodbye to our two team seniors: Evan and Will. These two team members have been with MAYHEM for a combined seven years! The younger team members will surely miss the seniors’ patience in explaining big concepts, their humility in considering others’ ideas, and their leadership in making sure that every rookie’s voice was heard. Evan and Will, your impact on Mayhem is much bigger than the robot you’ve helped to build! We are very blessed to have such a successful season, and we wish to thank everybody who aided our team in any way. Thank you monetary sponsors, material donors, mentors, parents, other teams, event volunteers, venue sponsors, fabricators, alumni, and everybody else for such a memorable season!